Anhui Province in southeastern China is situated 29"25"-34"39" north latitude and 114"43"-119"38" east longitude, covering an area of more than 130,000 square kilometers. Lying in the middle and lower valleys of the Yangtze and Huaihe rivers, it borders Henan, Shandong, Jiangsu, Zhejiang, Jiangxi and Hubei provinces. . The part of Anhui north of the Huaihe River has a warm-temperate, semi-humid monsoonal climate while the part south of the river has a sub-tropical, humid monsoonal climate. The mean annual temperature is above 14â„ƒto 16â„ƒ from north to south -- the hottest month, July, averaging 27-28oC and the coldest month, January, -3-3oC -- and the mean annual precipitation is 750-2,000 mm. Anhui Province is divided into 17 prefecture-level cities, 5 county-level cities and 56 counties, with a population of 59.86 million as of 2000, and mainly including ethnic groups of Han, Hui, Manchu, Zhuang, Miao and She, etc. Anhui Cuisine, one of the Eight Most Famous Cuisines in China, features the local culinary arts of Huizhou. Most famous dishes include Stewed Soft Shell Turtle with Ham, Bamboo Shoots Cooked with Sausage and Dried Mushroom, and etc. Hui Opera, Lu Opera, Huangmei Opera, and Fengyang Flower Drum, etc. The special local products include the Four Treasures of Study -- Xuan paper, Chinese paintbrushes, Hui ink, Xi inkstone, as well as some world-renowned tea products. 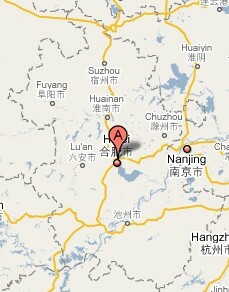 Anhui Province is called Wan for short, with Hefei as its capital city. Anhui was officially established as a province in 1667 in the Qing Dynasty (1644-1911). The word, "Anhui", derives from the acronym of Anqing prefecture and Huizhou prefecture. Anhui abounds in natural resources. It is one of the important agricultural provinces, with products ranging from rice, wheat, cotton, vegetable oil crops, cotton, tea, jute, silkworm cocoons, and roast tobacco, etc. Its main mineral deposits are coal, iron ore, and copper ore.
Anhui is famous for its picturesque mountains and rivers. Huangshan Mountain, Jiuhua Mountain, Tiazhu Mountain, and Qiyun Mountain are well-known mountains, and the region's premier tourist attractions, some of which have been inscribed in UNESCO's World Nature Heritage List.